Title of the work: Destellos, abismo. Orchestration: flute and bass flute -1 player-, bass clarinet and double-bass clarinet, percussions, piano and cello. Percussion details: -1 player: - Vietnamese or Javanese gong –low-. 3 Javanese gongs (1 little and 2 medium.) Spring coil. Metal chimes. Small Javanese gong. Tubular bells: La b 3, La 3, Si b 3, Tam-tam. Marimba. Vibrafono. 4 tom-toms. Triangle. Bass-drum. Percussion instruments assigned to the other performers: played by the singer: percussion resonant metal instrument 1. It would be: a triangle, a spring coil, finger antique cymbals; played by the flutist: percussion resonant metal instrument 2, not pitched. It would be: a triangle, a spring coil, a chinese suspended cymbal, metal chimes; played by the clarinetist: percussion resonant metal instrument 3 (It would be: a triangle, a spring coil, a little suspended cymbal, a little tibetan singing bowl...); played by the pianist: percussion resonant metal instrument 4, it would be: a spring coil, a suspended cymbal –low-, a little gong, medium tibetan singin bowl; played by the cellist: percussion resonant metal instrument 5 (it would be: a spring coil, a low triangle, a cymbal –medium-, a medium tibetan singin bowl, metal chimes). Commission: Commande de l'État, French Ministry of Culture. First world performance: 09.02.2015, Paris, Festival "Présences", Studio 105 de la Maison de Radio France, live broadcasting by Radio France. Score (300 px, only with authorization).. Score (high definition, only with authorization). Complete recording (mp3, only with authorization). 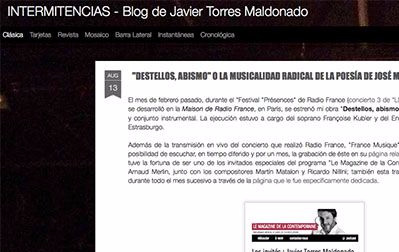 On February 9 (2015) the Festival Présences of Radio France in Paris will host the first performance of Destellos, abismo for voice and ensemble on a text by José Manuel Recillas. The performers will be the soprano Françoise Kubler and the ensemble Accroche Note. The composer writes: «Destellos, abismo was composed between 2006 and 2010 on the poem De lo que fue no queda nada, written for the occasion by José Manuel Recillas, more or less simultaneously with the composition of my piece. The work is organized in ten modules which decrease in length towards the centre and then expand again towards the conclusion, in a structure corresponding to the geometric image of a parabola. In fact on the basis of this idea the work could be considered a sort of journey of initiation in which the basic object is regenerated starting from an almost fractal conception, whose transformations distance it from its primitive state to subsequently invert its path, being born again in a sort of process of renewal. Each module therefore presents a different “poetic object”, set in relation to the transformations undergone by the musical objects. The text represents an exploration towards a profundity contrasted with the superficiality of the contemporary world, which encourages an individualism that is fierce but without any precise identity. Thus the condensation of the temporal durations can also be seen as a concave structure that presents a clear initial distension, which becomes increasingly compact until the generation of an inverse, centrifugal movement that influences the changes of speed in the process of composition. The search for a symbiosis between music and poetry led José Manuel Recillas and me to work on the creation of operative codes that enabled us to create confluences between the “poetic objects” and the “musical objects”. In the words of Recillas himself the text born of this collaboration comes from the exploration of hallucinatory phenomena, their effect on the conscience and the transformation of the perception of reality, as well as the emergence of a new state of consciousness that links the individual to the universe in a sort of illumination. The ideas of the text were conceived starting from the central module and at the same time in the natural order in which they appear, and similarly the structure of the musical part and that of the literary text are like the movement of a pair of wings, a threefold symbol: of flight, of sound and of the hallucinatory process. These ideas constitute a unique adventure, the question and answer about liberty as well as about language, both literary and musical, and at the same time an expression of independence». Javier Torres Maldonado is working on a new piece for large orchestra, commissioned by the Mineria Symphony Orchestra of Mexico City. His main projects for 2015 include a Commande d’État for a piece destined for the Ensemble Sillages.